The IPCC has long acknowledged that water vapour is the Earth’s most influential greenhouse gas. 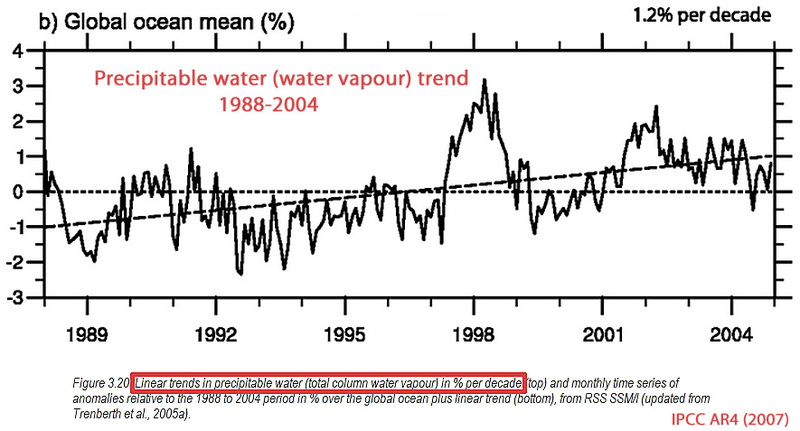 In the 2007 report, the IPCC reported an increasing water vapour trend during the 1980s to 2000s. Utilizing the IPCC’s own figures and models (from the 4th report), water vapour’s proportional contribution to the total planetary greenhouse effect reaches a dominating 96%. In contrast, CO2’s proportional radiative forcing contribution to the greenhouse effect is just 2.7% regardless of the CO2 concentration level. In a seminal paper (currently 1,440 citations) published in the journal Science entitled “Cloud-radiative forcing and climate…”, Ramanathan et al. (1989) conclude that the cloud contribution to radiative forcing (both shortwave and longwave) is ten times greater than doubled CO2. 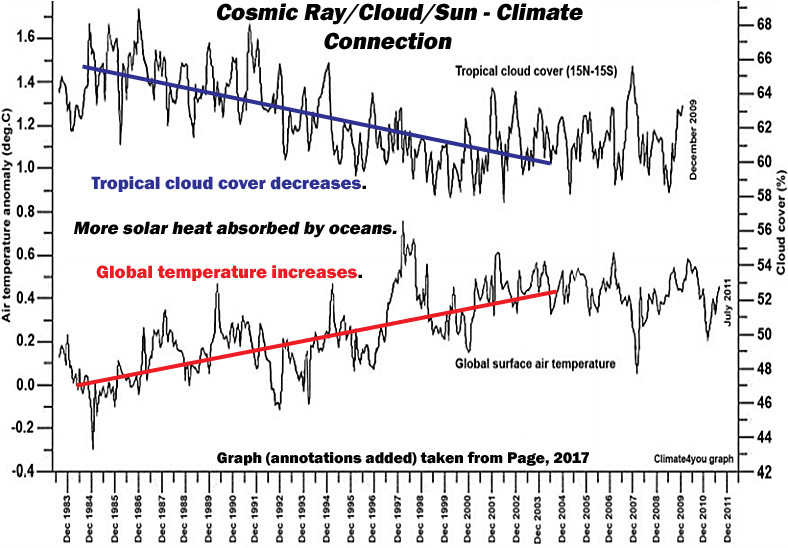 Cloud cover changes are significant determinants of the Earth’s top-of-atmosphere (TOA) radiation imbalance, or how much solar radiative forcing is absorbed by the Earth’s surface (oceans). More cloud cover on a net global scale means less solar radiation penetrates the surface, which leads to a net cooling, and less cloud cover means more solar radiation penetrates into the (ocean) surface, which ultimately leads to net warming trend. In other words, clouds significantly determine global warming (or cooling) trends. Despite the widely recognized prominence of water vapour and clouds in models of greenhouse forcing, a new paper published in Climate Dynamics fails to even identify either factor as a contributor to global temperature changes during the 1984-2005 period. Instead, the 5 authors have decided that carbon dioxide (24%) and methane (19%) are the dominant greenhouse drivers of recent temperature variations, and water vapour and clouds apparently no longer assume any role. Meanwhile, the authors do recognize natural solar forcing factors (17% combined), natural ENSO variability (12%), and volcanic aerosols (23%) as assuming slightly more than half of the responsibility for temperature changes combined since the mid-1980s. Methane: A Primary Driver Of Recent Temperature Change? It would appear rather odd that Bhaskar et al. (2017) would wish to claim, for example, that methane gas has been a significant driver of warming, but at the same time reject water vapour and cloud cover changes as factors affecting global temperatures. It is likely, though, that the main reason why these authors chose to aggrandize the influence of methane emissions on climate is because it is not currently acceptable to claim that human activity plays only a small role (<25%) in temperature variations. Therefore, adding methane emissions to the list of anthropogenic dangerous “greenhouse gases” could bolster the perceived human influence percentage to within “acceptable” ranges (near 50%). However, recently published scientific papers contravene this approach and indicate that (a) we just don’t have substantial observational evidence yet to attribute cause to a the rise in methane, (b) methane emissions may not have increased recently after all, and (c) human activity (fossil fuel consumption) has not been the “dominant factor” driving the (assumed) increase in methane. CO2’s alleged 24% contribution to temperature changes since the 1980s (Bhaskar et al., 2017) is substantially smaller than most estimates. NASA’s Dr. Gavin Schmidt, for example, claims that the human contribution to climate changes since the mid-20th century is 110%. 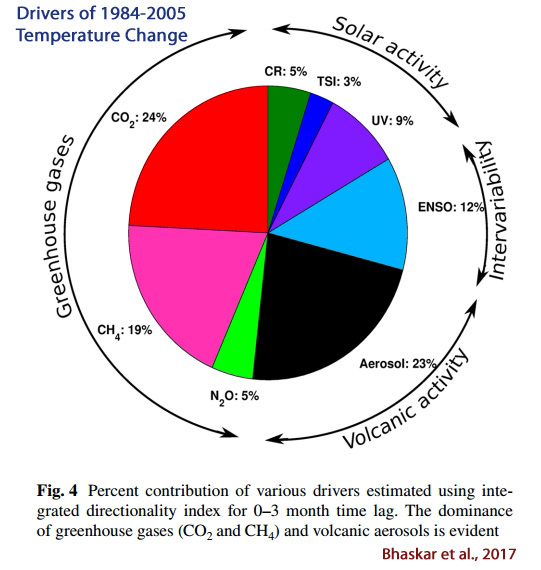 As suggested above, the dubious inclusion of methane as a driver of planetary temperatures may have been added to expand the (perceived) anthropogenic contribution to climate change. Likewise, Bhaskar et al. (2017) may be tendentiously excluding variations in natural factors like clouds and water vapour in their attribution analysis because they wish to avoid having to explain why the contribution from human activity is modest to negligible for recent decades. When the results don’t fit the narrative, change the results. In 1967 van der Hulst devised a modified Mie calculation to reduce the number of Lagrangian terms when solving for back-reflection from large droplets. This was needed to reduce the calculation time. In 1969 Hansen found that predicted ‘reflectivity’ was the same as a full calculation. Unfortunately both workers failed to understand that the second and subsequent scattering processes were very different from a plane wave (30,000 times more for 500 microns radius). Hansen concluded that the 2nd AIE offset CO2-AGW. However, his and van der Hulst’s mistake reversed the sign: much if not all recent AGW was from the effect of manmade aerosols reducing cloud albedo. 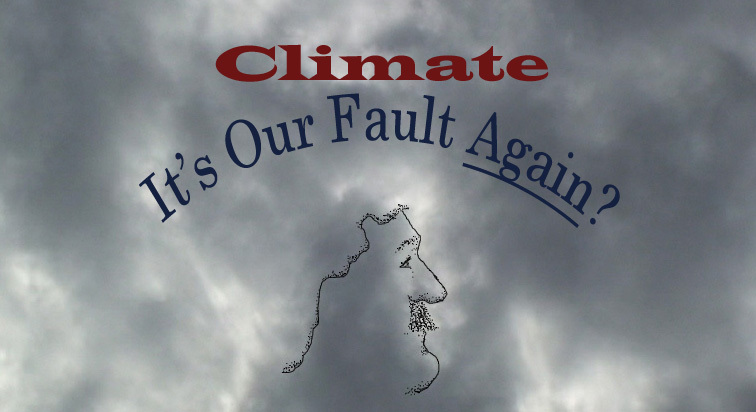 So, the climate scam has for 50 years been based on a fundamental mistake in aerosol optical physics. As for CO2-AGW, the water cycle completely offsets it. The reason appears to be thermodynamic in origin; near constant radiation entropy generation in the lower atmosphere. The 2nd AIE and changes in the thermohaline circulation explain Milankovitch amplification. As for Arctic melt freeze cycle and Antarctic freezing, both are the result of the response of the planet to the 1980s – 1990s heat accumulation. Because this heating has been assumed to be from CO2, the GCMs are wrong, particularly the positive feedback, which is an artefact. We are now entering the new LIA so expect 30 to 50 years cooling. Declaration: I am not a climate alchemists because no-one would employ an heretic. However, many new papers are being published from heretics now the alchemists are accepting they have made very fundamental mistakes. The alchemists made a fundamental aerosol optical physics error in 1969 (Hansen). In 1976 R D Cess got the radiative physics wrong. GISS backed this up using negative convection, which does not exist. The late husband of Julia Slingo, who became UKMO’s Chief Scientist, devised an incorrect Kirchhoff’s Radiation Law replacement based on the incorrect optical physics. That incorrect physics is being dumped by the UKMO to prevent the UK taxpayer from understanding that they were duped for political reasons – the positive feedback is a modelling artefact. Real CO2-AGW does exist but mostly offset by the water cycle: the cause is thermodynamic, minimisation of radiation entropy change from the stable level for a given THC. The increase of Antarctic pack ice is the main result of the planet’s stabilisation process. Has anyone bothered to analyse the impact the ever increasing amount of pastoral irrigation going on and how spraying vast volumes of water into the sky might just correlate with an increase in temperature? Water vapor appears to give negative, not positive, feedback. Of course the situation is much more complicated, but it is important to start with correct basic principles. That’s not what the climate models say. The models claim that the 1.2 C warming from doubled CO2 (560 ppm) will reach 3.0 C and up due primarily to positive feedbacks with water vapor. In other words, the models say that water vapor feedback will cause more warming than CO2 itself. I am always amazed that the physics of clouds have never been adequately researched. There is no complete and coherent theory and observations of how they work. Thus surely our understanding of climate (and weather) without proper recognition for this major player is very incomplete. So ‘climate science’ is just a work in progress and should not be relied on to produce credible outcomes. Much of the physics is well-known and well-understood. The problem can be with applying the knowledge. Clouds block radiation and the more dense the cloud is the more radiation is blocked (e.g. cummulonimbus clouds block a lot, cirrus clouds block very little) so you need to know the cloud density before you can work out how much is blocked. The next problem is the radiation, or more correctly which way it is going. Clouds during the day cause lower temperatures (assuming no wind) and clouds at night cause warmer than normal temperatures because heat isn’t radiating into space. A cloudy night after a bright sunny day can mean quite warm overnight temperatures. But … in high latitudes (eg. northern Scandinavia) cloudy days in November and December are typically warmer than cloud-free days because the Earth’s surface has a net radiation loss at the time (i.e. outgoing heat loss exceeds radiation received from the sun). The influence of clouds is a complex issue and very difficult to include in climate models. I’ve lived and worked many years in desert regions and often noted the extreme temperature drop at night when seeing was good for my astronomy habit. When seeing was not so good, higher humidity, temperature did not drop as much. Was this a warming? At night? NO! It was a delay in cooling and still not a cloud in sight. Have observed this same effect here in the UK when after a warm sunny day with very light wind, temperature starts to drop quite rapidly after sunset. All normal. Now if an extensive cloud bank arrives overhead temperature can rise! Again, is this warming? NO! It is normal surface radiation reducing under radiation from cloud overhead. The rise in temperature was the heat capacity of the ground. The silent UN’s modeled cloud. And debunk CO2’s feigned might. I want give credit here where credit is due. A write-up of my paper by Dr Roy Spencer indicated that I over-stated the increase in insolation due to a reduction in cloud cover I didn’t take certain factors into account. Judith Curry made a similar but less detailed statement on her blog. I accept both statements but at the same time point out that my aim was to show the change was in the ball-park regards IPCC estimates of warming, not factors of ten away from from it. As for this new paper, it sounds like nonsense. My paper showed the very strong link between the ENSO and the global average temperature anomaly a few months later over the period from 1950 to 1987 and other papers have made similar findings. The two graph lines coincided very well, except for periods of volcanic eruptions in the tropical Pacific, and there was no sign of the gradual divergence that one would expect if CO2 had anything above a negligible influence. If there’s no sign of CO2-driven warming from 1950 to 1987 then it’s illogical to expect CO2-driven warming to suddenly become significant after that period. Data for cloud cover is admittedly limited but the data we do have indicates a reduction in total cloud cover and a shift from low level cloud to mid and upper level cloud. From what’s known about clouds and the Earth’s energy balance these changes would lead to higher temperatures. Global solar irradiance showed a significant fluctuation during the last 90 years. It increased from 1920 to 1940s/1950s, thereafter it decreased toward late 1980s. In early 1990s 75% of the globe indicated the increasing trend of solar irradiance, while the remaining area continued to lose solar radiation. The magnitudes of the variation are estimated at +12 W m 2 [1920-1940s/1950s], – 8 W m 2 [1950s-1980s], and +8 Wm2 [early 1990s-2005], for the first brightening, for the dimming, and the recent brightening periods, respectively.